Picture-perfect condo is complete with updates throughout! 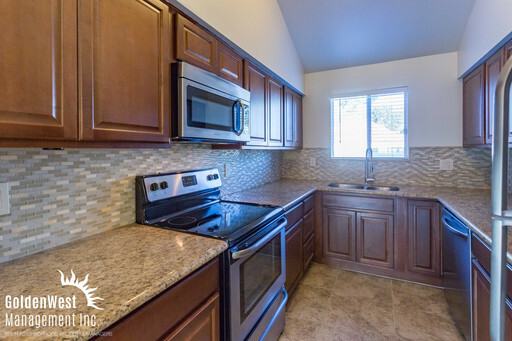 This single story unit features vaulted ceilings, beautiful wood flooring, French doors leading to the private back patio with extra storage and laundry room including full sized washer and dryer! 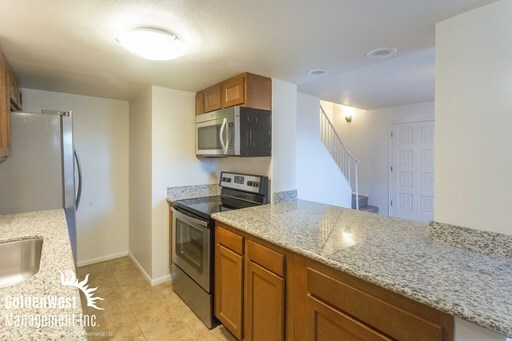 Kitchen is equipped with a full stainless steel appliance package, dark granite countertops and newer cabinetry! 2 spacious bedrooms with fresh carpet and plenty of natural light make this property hard to beat! Bathroom is complete with tiled shower/tub combo, new vanity and upgraded fixtures! You will further enjoy the convenience of 2 covered parking spaces located just behind your patio walls. The quiet community features lush landscaping, mature trees and a sparkling pool.